When Eugene Stoner designed the M16, it came with a 20" barrel and what we now call a "rifle-length gas system". Even though the barrel is 20", the gas tube length from receiver hole to gas port in the gas block is 13". Currently, this is the longest available gas system for AR's. Why is a longer gas tube better? First let's define dwell time. Dwell time is the time the projectile (bullet) stays in the barrel once it passes the point of the gas port before it exits the muzzle. By shortening the dwell time (or distance between the gas port and the muzzle), you can reduce the amount of gas which goes through the gas tube and back into the receiver of the AR-15. Minimizing gas into the receiver will reduce recoil and reduce wear and tear on internals parts as the bolt carrier is not being slammed by gas and cycling the weapon quite as forcefully. Follow? 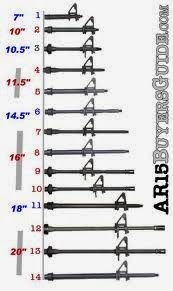 If you refer to the chart above, you see a rifle length 20" barrel beside #13 and #14 (one is lightweight and one is an HBAR). The most interesting feature to note about that barrel is the distance between the front sight/gas block and the muzzle. I know you can't measure it on a computer screen so I'll just tell you that it equals 7.5". So naturally, trying to maintain that maximum dwell time distance of 7.5" should be our objective here. Which brings me to the current M4 Carbine setup. As you can see from the barrel beside #7,#8,#9 (carbine gas system LW, HBAR, and standard) the dwell time distance from the gas block to muzzle is larger than 7.5". Actually, it's 9.5" to be exact. Many people may have never known this or would be able to tell just by picking up 2 different rifles and shooting them. But that 2" makes a difference, in dwell time, recoil, and internal wear and tear. (Almost) all AR-15 barrels shorter than 14.5" use a carbine length gas system, simply because anything shorter is not feasible and there is not enough barrel left to go any longer with the gas system. The exception is the pistol gas system, which you can see in #1. A 14.5" barrel with a carbine length gas system has a gas block-to-muzzle length of 7.5", the "ideal" length, as you can see in #6. Unfortunately, there is no picture for a mid-length 14.5", but it offers an additional advantage of 1.5" reduction in dwell time. The most ideal setup of all is #11, the 18" barrel with rifle length gas system. Notice how little barrel there is left on the end? Almost all 3-gun shooters use this setup. There's a reason why. It shoots incredibly soft. SPR..mmmmm. Gas block close to muzzle. Yes please. So hopefully you've now learned the differences in gas system lengths. There are a couple better options than your standard carbine length gas system that you'll see in your stock AR-15. If you're looking at a new rifle or thinking of building, I'd strongly encourage you to consider a mid-length gas system for your rifle, as it will give you some clear advantages over the standard setup. If you are planning on an SPR-style 3-gun build, then you should aleady know that rifle length gas with an 18" barrel is the way to go. There are many companies offering mid-length rifles already, and you can find some of these at Strongsidetactical.com. i have a new 20" barrel what gas tube would i need?